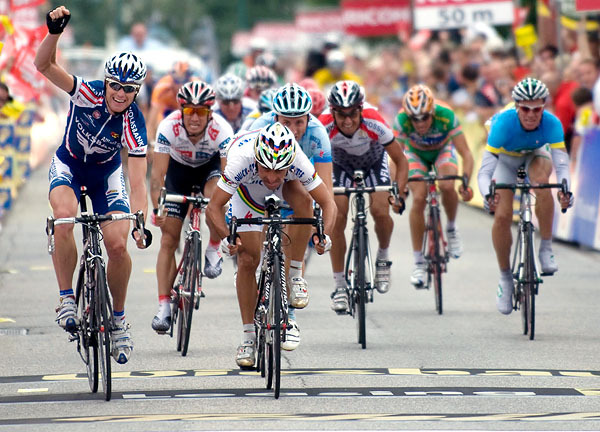 It has been a very exciting first stage of the 60th edition of the international Tour of Austria: Gerrit Glomser who won the Tour of Austria twice, was looking forward to his victory too early and Paolo Bettini caught him a few meters from the finish line. Bettini celebrated his first win of the season: "I like Austria! I was world champion in Salzburg and this season has not been very successful for me at the classics and the Giro d'Italia. " 'Hero' of the day was Dominik Roels (Milram) from Germany: 35 kilometers after the start in Toblach he attacked and was at the top for more than 120 km. On the climb to the Lake Misurina, 20 kilometers from the finish, Roels was caught by the chasers. Then the race started to become very exciting. 14 riders built a leading group with all the top riders: Davide Rebellin, Thomas Rohregger, Gerrit Glomser and Paolo Bettini. On the last few kilometres ten more riders joined the leading group and 24 riders arrived in Toblach, where eventual winner Paolo Bettini was greeted by his fans. Gerrit Glomser who was caught a few meters in from the finish was disappointed. 300 meters in front of the finish he started the sprint. "Three meters in front of the finish-line I thought I won the stage, but unfortunately I had not seen Bettini. He was just a little bit faster than me. " Paolo Bettini won the yellow jersey and leads the points classification. The mountain jersey will be worn by Giampaolo Caruso. And Gerrit Glomser earned the Tchibo jersey of the best Austrian rider. 10. Jurgen Van Den Broeck (Bel) Silence - Lotto all s.t.